We all do it at one time or another. We pretend that things are okay when they're not. We pretend that we feel well when we don't. We pretend that what someone has said or done to us is okay when it's not. I am a firm believer in picking your battles and turning the other cheek at times, but what happens when pretending becomes fully entrenched in our lives and we are unable to stop its vicious cycle. What happens when we pretend so much we lose who we are? How do we know when this has happened? How do we know when we need to stop pretending? I believe there is a time when we know in our hearts, minds, and bodies that pretending has become unhealthy for us. I first wrote about rediscovering the essential me here, and one of the things I am discovering on that journey is that I do a lot of pretending. There are many reasons that we pretend, but for me I believe that it has to do with several things. I was conditioned to believe I had to be perfect. I don't want to hurt anyone else's feelings. I really hate confrontation. I also know that the time has come for me to stop the excessive pretending. By suppressing who I really am and allowing others to do and say things to me that aren't okay I am hurting myself both physically and mentally. I also know although I may have an MS in Counseling Psychology, which helps me to recognize and understand when this is happening to other people, I don't always want to recognize and admit that it has happened to me. So how do you and I stop the cycle of pretending? I recently found these tips on the Unbounded Spirit and they are so good I thought I would hang them up where I could see them as a daily reminder, and that it would be great to share them with you. 1) Learn to say “No." To say “Yes” is not a bad thing, but to say “Yes” when your hearts feels like saying “No” is certainly not a good thing. Never be afraid to express your true thoughts and feelings, even if they oppose those of others. Stop trying to please others if you don’t feel like it (Remember: helping is one thing, sacrificing yourself is another). 2) Don’t imitate. Everyone is different so everyone should live his or her own way. To follow another’s way of life simply means to suppress yourself. Create your own path and walk on it. 3) Speak the truth. Be honest first with yourself and then with those you come in contact. To lie means to be in an endless kind of anxiety because each lie must be covered up by another lie, and so on ad infinitum. Being honest is the best way to be at peace with yourself and others. 4) Dare to be alone. It is better to be alone and yet true to yourself and confident for who you are, than to be in the company of others by lying out of fear. Only once you have overridden the fear of being alone, will you be able to let go of the need for social approval. This, in turn, will allow you to build genuine relationships. 5) Do what you Love. No matter what others expect from you, don’t compromise your way of life. Whatever you enjoy doing, keep on doing, whether others like it or not. This will keep you tuned into your inner voice. Thank you to The Unbounded Spirit for all of their great ideas and information. 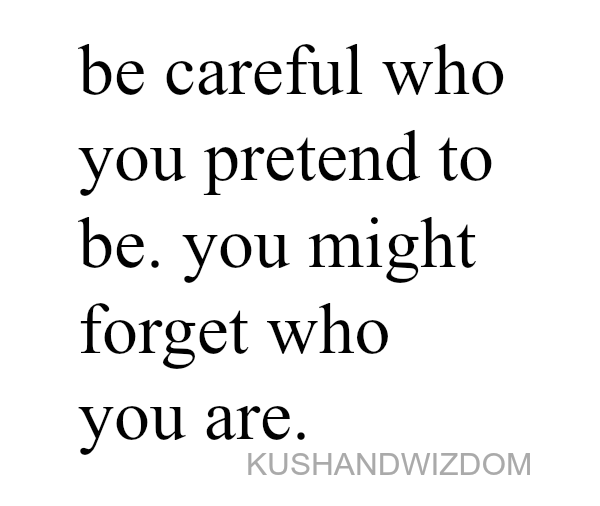 So, are you a pretender? I say no a lot. One of the best things ever! It is one of the best things ever, Michelle. Alone is not bad at all. In fact, I prefer it. I enjoy alone time too, Brenda. Sometimes I am. I'm better than I used to be about saying no and standing up for myself, now that I'm older. I think it's from being the oldest child...a perfectionist, people pleaser. Good advice! I've gotten better with age! Kinda like cheese....or wine! Thanks Laura!